Pardon the sailor in me, but why don't I see the use of stabilizing sails in use? I don't know why you don't see more of them in use. They do work. Not as well as other forms of passive or active stabilization. But designed and deployed properly they do definetly help with roll. Maybe people feel they don't work well enough to justify the cost? Or they think they are to much hassle to setup? We looked at adding a sail to Hobo. With our current boom and mast we could only have about a 110 sq' sail and our displacement is 44K lbs. That and having to beefed up the standing rigging we didn't see the added benefit/effort. What has always been much more remarkable to me is the large number of cruising sailboats I see without a sail up, rolling and yawing in conditions perfect for sailing, or at least a reefed main. is the large number of cruising sailboats I see without a sail up, rolling and yawing in conditions perfect for sailing, or at least a reefed main. A sail should be up, not sure why. I often think the same thing, they don't even take the sail covers off! FWIW: Almost all of George Buehler's Diesel Ducks utilize some sort of sail stabilization and or paravanes. Just comparing stabilizing effects on my own boat while underway in a beam sea, my bilge keels reduce the rolling by an estimated 10%. Raising my sails reduces the rolling by a further 70-80%. The only time they aren't extremely effective is when there is no wind. The time and effort needed to raise a small set of sails is minimal. It takes me less than 5 minutes, singlehanded, in most conditions. With a self tacking jib, they are almost "set & forget" unless I want to wring the last 0.1 knot out of them. 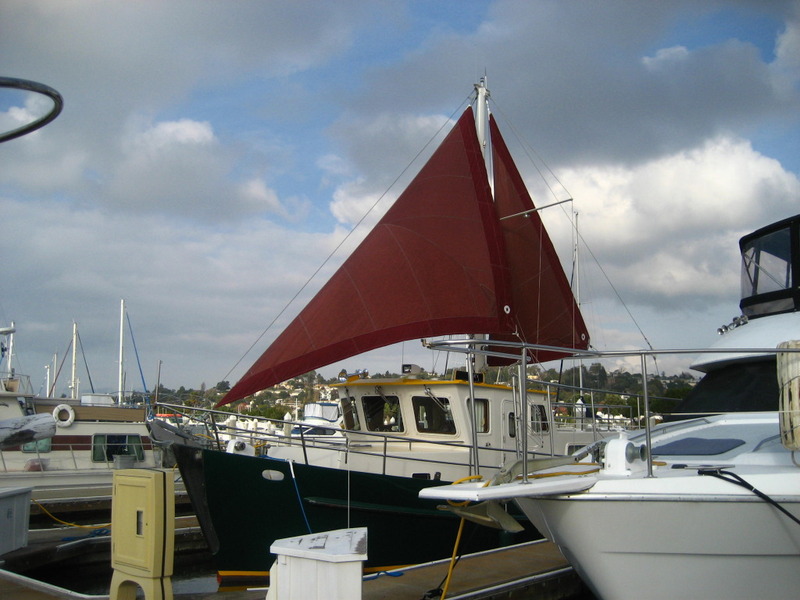 A limiting factor may be than many trawlers (but not all) do not have a keel designed for sails. Without ballast down low, sail area may have to be limited to the point where the effect is negligible. At least 30 square feet per ton of displacement is needed to be effective. Some of the Taiwanese trawlers have about half this, and this may have added to the myth that steadying sails don't help much. On my last boat the sail hardly reduced roll at all until the wind got above 10 kts or so. It really helped at anchor though, to prevent 'hunting'. We need at least 10 knots from the beam to be effective and adds about a half-knot if moving below hull speed with both sails hoisted. Most of the time, however, winds are from astern or forward where I operate. We have a steady sail but does very little for stability, but does reduce the sway hunting at anchor. I have seen a few long range coastal ocean trawler with forward deck sail like Marks for added range. Krogan use to and diesel duch still does. For our 40 ton boat fish para vanes are the best bang for the buck for stability. Most are so small , and weak they nhardly matter. If serious long range cruising is being planned the Motor Sailor has come a long way from the 50/50 of the 1950s. Great point, makes sense! Thanks! At least 30 square feet per ton of displacement is needed to be effective. Where did you locate that 30' requirement? Fond this article kinda interesting. 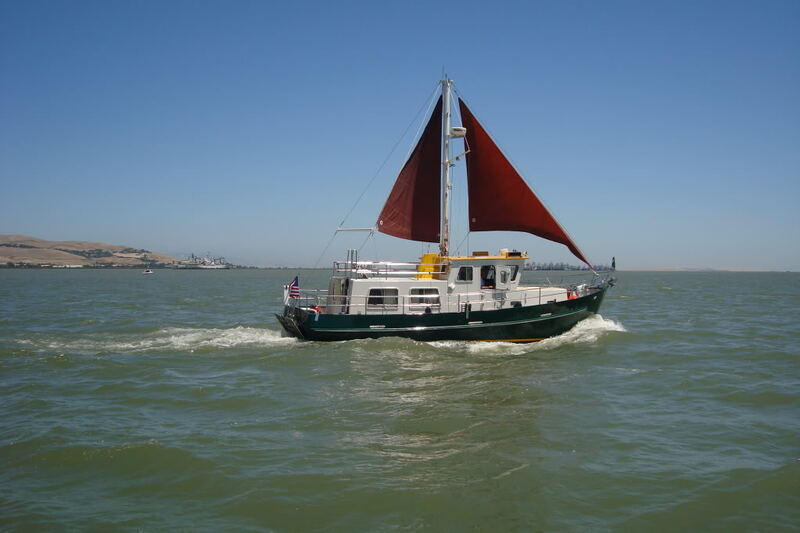 "For a couple of decades I owned an older Willard Horizon motorsailer. power and sail whenever the wind was suitable. 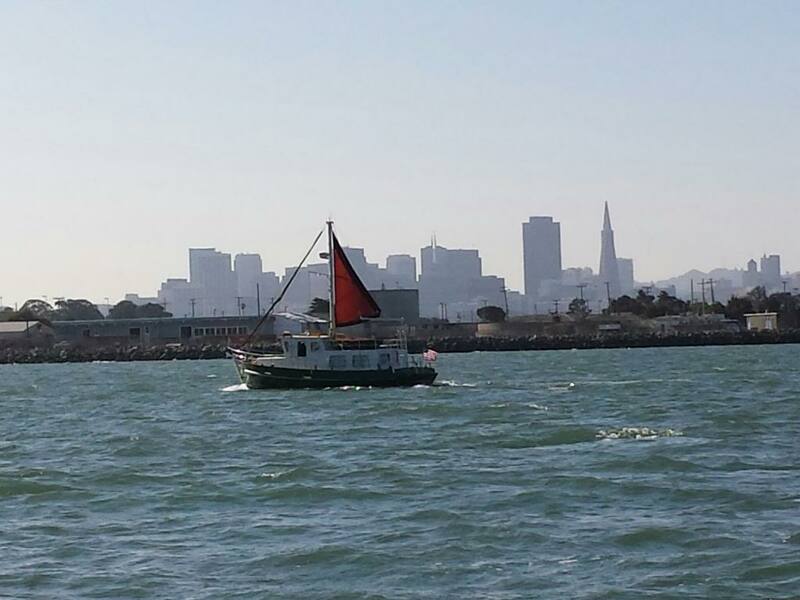 Fuel consumption dropped to low levels and the sails stabilized the boat. home or steadying rig designed by a good naval architect." The 30ft2/ton figure was from my own experiences. Under a reefed mainsail alone (23ft2/ton), although it stabilises rolling under strong winds, it is still a lot of motion with winds under 15-20 knots. Under full 200 ft2 gaff rigged mainsail (31ft2/ton) it becomes very comfortable. When I add the jib, it is a solid a rock. Obviously, wind speed & direction comes into the equation as well. Smaller sail area becomes more effective when winds are blowing hard in the same direction as the swell. My suggestion of 30ft2/ton was to cover most conditions including lighter winds. I still get caught when I wait for a storm to pass, then head out the day after with little or no wind, but still rough mixed up seas. That's when I wish I had paravanes. It's always been my understanding that a true steadying sail is cut flat. Not that you can't make one that is cut for lift. I wonder if one cut flat makes it any more effective as a pure steadying sail? What about wakes? In the rivers where we normally boat, it is difficult to avoid large semi-displacement or planing vessels and their large wakes. A steady sail will do little or nothing about wakes. Unless perhaps the wind is blowing strong and the boat is already pinned over very hard to one side. In Voyaging Under Power, Beebe's experience with a steadying sail had very little effect on reducing roll. Don't remember the percentage, but he said it wasn't worth the trouble IIRC. Doubt it, but a flat sail would be easier/cheaper to make.